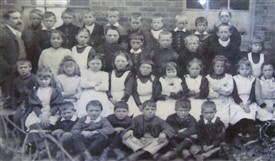 When the school at Foulness was started as a Church of England School in 1846 there were about 120 children on the island, out of a total population of 674. When the school closed some 140 years later there were just eleven pupils left. By that time the school was managed by Essex County Council and there were more teaching and ancillary staff required to keep it functioning than there were pupils. The school was built by public subscription but when in 1872 it needed to be enlarged for an estimate of £380.00, a rate of 3d was imposed to meet the cost. Until the church school was founded there had been no education for the children of Foulness, as in many rural areas at that time. The school log books, which started in 1872, show that even then the priority of many families was for the children to help with farm work when needed rather than attend school. Another drawback to regular attendance was bad weather and the lack of proper roads on the island. Some children had to walk for miles to school across the fields often crossing waterways by plank bridges. Heating was provided at first by an open fire but in 1905 a stove was installed. However, this was still not enough to heat the school room properly. On 22 January, 1907, although the fires had been lit at 7.40 a.m., the temperature by 9 o'clock was still at freezing point. School meals were prepared on the stove but when the Havengore bridge was built in 1922 the meals were brought by van from the mainland. Later on meals were prepared for a short while in the Rectory kitchens and then school meals were cooked in the school itself. Like much of the island, the Foulness school suffered in the floods of 1953 and was closed for some months for repair during which period the children were educated at Great Wakering Primary School. When it finally closed in 1988, there were less pupils than total staff. The school was left empty for many years while a use was found for the old buildings. 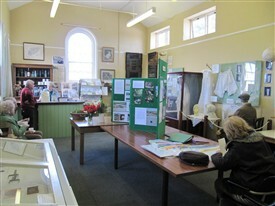 Eventually, early in 2003, the Foulness Conservation and Archaeological Society was granted a 15 year lease for the school buildings and the Heritage Centre was opened in time to commemorate the 50th anniversary of the great floods of 1953. This page was added by Sue Horncastle on 22/05/2012. Would anyone know the date the two photographs of the schoolchildren was taken ?